The Volvo XC60 Inscription Trim is a new addition to the popular Volvo line of mid-sized SUVs. It combines practical driver safety features with luxury items like massage chairs, ventilated seats, and heated seats. The exterior has a smooth shape, a distinctive grille, LED headlamps, and dual exhausts. Cockeysville-area motorists appreciate the new driver assistance technology. The Volvo Run-Off-Road Mitigation system helps keep vehicles on course. The 12-inch information display is intuitive and easily read at a glance. Other convenience features include keyless entry and the hands-free tailgate. 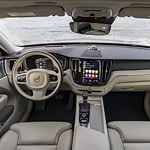 At Bill Kidd's Volvo Cars, we look forward to answering your questions and demonstrating the advanced electronic features. We invite you to drop by and take a test drive in the new Volvo XC60 Inscription Trim. You can get behind the wheel and experience the comfort and convenience of the advanced features. Please call or drop by today.